Now that your child is here, you probably can't wait to hold your precious preemie and finally feel like you are his mother/father. Your hospital may be telling you that you can't hold him, or they may not be providing you with the information you need to learn how to touch a preemie. I'd like to share my experience with you regarding this topic. I've learned so much from Gerte Graybill, the wonderful Physical Therapist (P.T.) who specialized in developmentally appropriate care. She spent many hours with us as we tried to soak up this wonderful approach. We were blessed with many wonderful primary nurses who were Sammy's regulars. They all worked very closely with the P.T./O.T. department and helped us learn developmental care. Gerte started working with my son Samuel when he was only a pound. You may wonder what kind of physical therapy could be done on a baby so tiny. She wasn't doing any exercises with him, that's for sure. She was helping position him in a way that would help him order himself. She made every effort to protect his very fragile and raw nervous system, and keep others doing the same. We were taught how to do deep touches. She told us to pretend that our hands were the walls of a uterus. We were NOT to lightly stroke or feather-touch him, but rather to place a firmly cupped hand on his head and/or curled up legs and then remain still with a firm, constant pressure. (See a short video of mom touching Sammy for the first time. After you have viewed it, click on "BACK" to return here). We started out doing this only a few minutes at a time, as tolerated. In the beginning, I felt that I was spending more time putting on a gown and scrubbing in, than I was actually touching him. She also instructed us on preemie talk. This was ways to approach Sammy so that he wouldn't become overstimulated due to his raw nervous system. The clues that your baby is getting overstimulated are desaturation of oxygen and either too fast (tachycardia) or too slow of a heartbeat (bradycardia). Sometimes, Sammy would tolerate noise, touch and interaction, and then other times he would yell "back-off!" by dropping his saturation. You should always keep checking the monitors to see heart rate, and saturation of oxygen, but even more importantly, check your child. 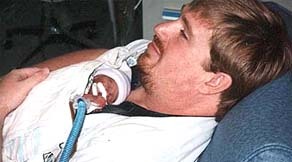 You will soon learn how your preemie is communicating with you and respect his wishes. Try to limit the type of stimulation to only one kind. For example, if you are going to place your very clean hands on him, then don't talk or sing (and vice versa). The same thing goes when you are going to make eye contact with him - meet his gaze - don't talk or sing or touch - -but don't keep the stare for very long. He may not know how to break the gaze and may feel trapped. When you are finally able to hold him, don't make eye contact at the same time, and don't talk/sing. It may be too much for him to handle. Hearing your heart, feeling your skin and smelling you - will be enough for him to handle. There will be plenty of time for him to he held, and looked at, and sung too. You will just have to wait until he is ready- just like any parents of a full-term baby have to wait to hold/touch/look/sing to their baby until he is born. 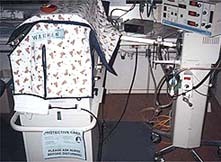 As your preemie gets familiar to the various stimulation around him, he will be able to tolerate multiple stimulation. See if there is a physical therapist who works with the preemies and parents in the NICU. Most of them are happy to teach the parents in ways to handle and protect the preemie. Tell them that you are interested in developmental care and in kangaroo care. Kangarooing means that you can place your baby directly on your chest (yes, both moms and dads can do this). 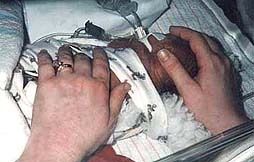 There is evidence that this skin-to-skin contact can be beneficial to the preemies. Your hospital may have specific guidelines about when your baby will be able to kangaroo, and unfortunately, some hospitals don't even allow it. Our hospital let us kangaroo Sam when he was only 799 grams, and still on a ventilator. Their policy was to wait until the baby reached 1000 g, but our primary nurses were such strong advocates that they let us start earlier. They knew that it would be good for Sammy and good for us. Sammy let us know that it was good for him by sat'ing in the high 90's and keeping a good strong heartbeat. He also let us know when to stop and let him rest. Kangarooing was one of the best things that happened to us in the NICU. It was the first time that I actually felt like Sammy's mom. My husband and I used to race to see who could get dressed first; the first one to put on a shirt that buttoned all the way down in front, got to Kangaroo that day. You can see that Daddy won on this particular day! Don't be surprised if your preemie regresses at times, in fact, you should expect it. You may have been able to hold and look and sing, and kangaroo. Then for a period of time he will not be able to tolerate any of this. He may even want, NEED, to be left completely alone. My son went through a negative touch period like this for several weeks. It was very hard for us to NOT touch, talk, sing, look. But it was what HE wanted and needed. It also corresponded to a time when he became very infected with Candida and he was using every ounce of strength just to stay alive; he couldn't spare any to interact with others. So, we would come to visit and just sit in a chair or stand by the window in his room without any interaction. This was very hard for us, I ached inside from feeling so helpless and unable to comfort my baby. Sometimes my husband and I couldn't even talk to each other near the isolette - Sammy would go into distress over the noise of our hushed voices. In fact, he was on one-to-one R.N. status, and during one period of time, the nurse had to sit on her stool over 10 feet away from his isolette. She could see all of his monitors and see him in the isolette. If she (or anyone else) approached his isolette he would CRASH! He did get over his "negative touch" phase. He soon learned to like the sound of our voices. As soon as my husband and I would get into the room and start talking (quietly of course) to the nurse to get a report of his status, he would start to increase his saturation!! He knew mommy and daddy were there! Today - he is a very loving boy who LOVES to be held and have close physical contact when he is not running all over the house, that is. One of the first words he learned was "hug!" Another thing that is VERY important....keep the light and noise around the isolette to a BARE MINIMUM!!!! I designed a quilted cover to fit over his isolette. (You could pile on blankets or quilts to do the same thing, or you may use my pattern.) This protected Sammy from the noise and intense light, and may actually have been a factor in him not developing retinopathy (blindness from prematurity called ROP). He didn't even had Stage I ROP which is amazing considering his extreme prematurity and the extended time on the vent with high oxygen settings. The nurses kept only a few lights on around his isolette so that they could see to do their job. At nighttime most all of the lights were dimmed. 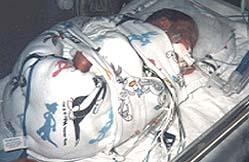 The noise level in an NICU can be deafening (alarms, ventilators etc.) We all talked in hushed voices. If another family in the room was making too much noise, Samuel would desaturate and have bradycardia episodes. You better believe I would ask the people to be quiet or have their conversation in the lounge. There were even some nurses that I would request not take care of him if our primarys were not available, because they were too loud, giggly and talkative. In order to keep the environment inside the isolette quiet, don't set things down on top of the isolette. The noise is amplified inside there and the sound waves bounce back and forth. This can be very disturbing to the child (imagine hearing the noises bounce around if you were in a tiny cave). There was one nurse who wasn't one of our primary nurses, that kept placing the chart, pen, stethescope on the top of Sammy's isolette, and everytime she did, he would desat and I even think I saw him flinch. I would remind her of this, and she would always thank me. She soon retrained herself and even started telling some of the residents to stop doing the same thing! ALSO.....talk to the attending doctors and the nurses to make sure they cluster his care. In other words, when they have to disturb him to take vitals, or give blood or medication or suction or WHATEVER, have them do it in a cluster. Let him have as long a stretch of uninterrupted/undisturbed time as possible. If someone is coming to examine him, run some test or do an x-ray and it is in the middle of one of his "breaks," ask them if they can come back and do it later. Most likely they can. Our physical therapist put a sign on his isolette that said he was in "protected care" and explained about "clustering" his medical care. This sign stated that all medical personnel should consult with the nurse and/or doctors about the timing of the medical care. 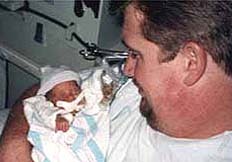 Your preemie needs peace; he needs the sleep to grow and heal. If you arrive and he has just had a lot of disturbances, then let him rest. You could probably use some rest yourself. Be protective about visitors too; keep them to a minimum. You may even put a sign on his isolette that said "SHHH, baby growing." I hope that this helps you feel comfortable about touching your child. 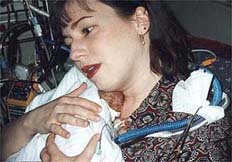 Isn't it amazing how much there is to learn about caring for your preemie? Isn't it also amazing how fragile and yet strong they are? Come to think of it, isn't it amazing how fragile and yet strong we are? COPYRIGHT 1998 Susan Warren. The original story, pictures, art, isolette cover pattern and tiny feet background contained in the web site are not to be copied which is prohibited by law.